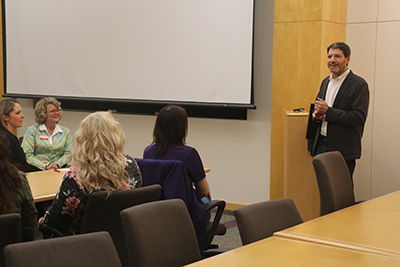 Joshua Rosenbloom, professor and department chair, addressed the 20 members and three ISU students in attendance at the Central Iowa Women in Agribusiness Quarterly Networking Event March 27, 2019. He was pleased the group was visiting campus and invited members to connect further with the department’s Agricultural Business Club, Ag Entrepreneurship Initiative, Extension and Outreach Women in Ag Program, and other activities. The networking group was surprised to learn women are 35 percent of the Agricultural Business majors this year. As a comparison, women are 81 percent of the undergraduates enrolled in the Animal Science major. The group discussed ways to make sure there is a level playing field for both men and women. The Central Iowa Women in Agribusiness is a networking and mentoring group whose members work in agriculture industries in Des Moines and the surrounding areas. Mekenze Cortum, Sales Development Specialist at Nationwide, leads the group.